No matter what niche you’re in, as a professional blogger you’ll want more than just a one time profit from your customers. You’ll most likely want some kind of residual revenue that streams in on auto-pilot for you on a regular basis. You want to increase your earnings by cultivating repeat buyers as well as getting new customers on board. Providing good content is a fantastic means to get individuals to your blog. Your material alone will pull in website traffic once it gets indexed by Google and various other search engines. Also, the more you blog the more targeted website traffic you will have. Another great way to drive website traffic to your blog is from outside resources. For example social media sites such as Twitter, Facebook, Pinterest, Instagram, and Google Plus are all great sites to share your blog on. Most people think that driving traffic to their blog is the hard part. Not quite. Once the visitors get there, you will certainly lose them for life if you don’t have a good technique to capture their name and email address. This is known as blog list building. You’re essentially putting together a list of potential clients which you can alert them each time there’s a new blog post, when you’re promoting an item, or when launching a new product. 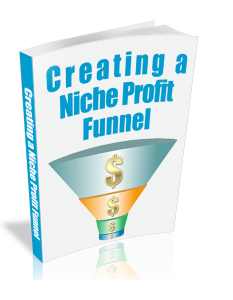 This is where knowing how to Create a Niche Profit Funnel comes in handy. You should capture e-mails on your blog site using a dependable autoresponder system. There are plenty of free ones out there but they do contain advertisements. There are lots of good paid ones out there and some even offer a free trial or price cut for giving them a try. Not sure what an autoresponder is? Read more here. This is where you need an unbeatable opt-in offer or bribe if you will. This is something that you’re willing to give your visitors in exchange for their name and email address. Your opt-in offer or freebie can be in the form of a digital download such as a free report. Just make sure your report is a good one because it’s not enough to offer a report on how to make your first $100 online, but offer it on how to make their first $100 today! There are two major benefits from your blog list building funnel. The first one is obvious, you now have a way to communicate with them through email marketing and the second is, you can immediately offer them an upsell to your freebie. See video below. Now that you have your visitor on your blog list, it’s time to get personal. It is a fact that the most visited page on most blogs is the ‘About Me’ page. The reason for this is that people are curious to know who the person behind the blog is. The same applies to your blog list. So go ahead, share with them a few personal stories or incidents that may have happened to you. Do not worry about seeming irrelevant. You want to become a ‘friend’ to your subscribers… and people know personal stuff about their friends. So, bring down your wall and be human. Share what makes you laugh and what annoys you… and whatever you think may be interesting. Your subscribers want to know who you are and we know that people are more likely to buy from people they know, like, and trust.